Ending the year with Christmas celebrations and ushering in the New Year with much gusto, auto manufacturers like Hyundai India are providing some great offers and special discounts on their cars clear their stock. This also benefits the buyers who want a new vehicle to begin the New Year with merriment after making a relatively lighter payment. Keeping this idea in mind, Hyundai India has introduced an offer that provides exclusive discounts on their selected models only for the month of December. Aptly named ‘December Delight’, the car carnival from Hyundai India presents offers on its once best-selling model Santro with cash benefits of up to Rs 38,500. While the entry level Eon is on offer with savings of Rs 43,000, i10 and Grand i10 carry savings of Rs 42,500 and Rs 44,000 respectively. Hyundai’s compact sedan Xcent packs savings of up to Rs 15,000 for its petrol model and Rs 48,000 on its diesel version. Moreover, Verna also comes with savings of Rs 43,000 on its petrol variant and an impressive Rs 69,000 on its diesel model. Where both petrol and diesel trims of Elantra sedan are being offered with benefits of Rs 70,000, the top of the line Sonata attracts a mammoth Rs 1,60,000 of benefits. The company claims to have put up all Hyundai cars on discount but Hyundai Elite i20 does not seem to feature anywhere on the banners and advertising website. To double the celebrations for Hyundai this year end, the much in-demand model Elite i20 has received outstanding bookings of 56,000 from the day it was launched. 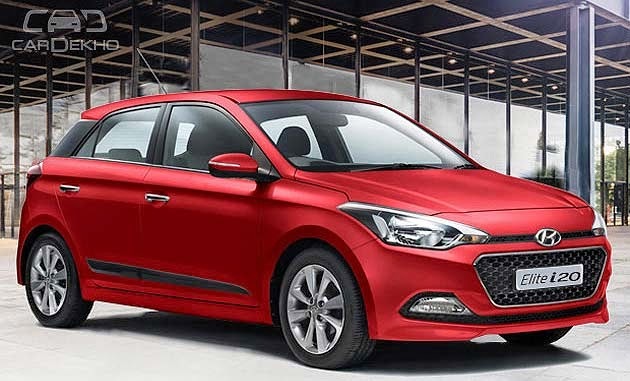 Apart from the booking numbers, more than 3 lakh people are said to have inquired about the new i20 model, adds Hyundai. The sales figure of Elite i20 is impressive too with the company selling 10,500 units of the model in the last month itself. This makes Elite i20 a strong contender and best selling model of the Hyundai portfolio. Available in four trims, Era, Magna, Sportz and Asta, Hyundai Elite i20 sales are currently on fire. The car is available in both petrol and diesel variants with the petrol model featuring a powerful 1.2 litre, dual VTVT engine mated to a five speed manual transmission. The diesel version comes equipped with 1.4 litre, U II CRDi engine paired to 6 speed manual transmission. The car offers premium comfort factors with features such as automatic climate control, power steering and power windows, height adjustable driver’s seat, rear AC vents and glove box cooling. The exterior gets a fresh look with refurbished headlight cluster, exclusively designed bumpers and prominent radiator grille. The model sports a sleeker rear with modern taillight cluster alongside graceful lighting pattern. The interiors have been tastefully carved in new pattern and dual color tone scheme. The newly designed steering wheel and improved seating arrangement and a lot of metal inserts make it exclusive in its class. Safety features such as ABS, dual front airbags, smart keyless entry, parking assist, advanced engine immobilizer, etc. have created a win-win situation for the new Elite i20. The Elite i20 is here to compete with the likes of Fiat Punto Evo, Maruti Swift, Volkswagen Polo and upcoming Tata Bolt. With the company offering 2 years of standard warranty period irrespective of the kilometers the car has covered, Elite i20 is a must grab for those looking for a new car with all the latest safety and technological upgrades. With so many features in its recent best selling model along with attractive offers and discounts on its other well performing models, Hyundai is ready to cash in big this year end.